Could fear be hindering search for missing hiker? 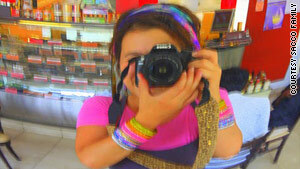 (CNN) -- Aubrey Sacco was living up to her motto, "glitter the world," on her five-month post-college trip through South Asia before she disappeared in Nepal last spring, her family says. The 23-year-old artist and musician from Colorado started her trip in December, teaching yoga to vacationers in Sri Lanka. Later, she went to India, studying yoga and volunteering to help schoolchildren with art and music. She's the kind of traveler you'd often find staying with villagers as opposed to high-end places, her mother, Connie Sacco, said. Aubrey looked forward to volunteering in Nepal after she finished a hike there, according to her mother. "She just glitters with her love and energy," Connie Sacco of Greeley, Colorado, said. "She goes from one country to the next. Glitter the world, one country at a time." As her parents have tried to determine what happened to her in the country where she was last seen, they've been worried by what they fear might be roadblocks in the investigation. 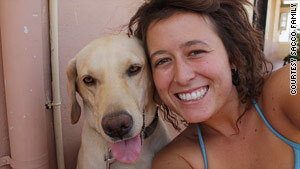 Sacco vanished in April during a hike along Nepal's sylvan and rocky Langtang trek. Some volunteers who've helped look for her say they've heard a disturbing refrain from villagers: Even if they or others in the area did know what caused her disappearance, they wouldn't reveal it. Perhaps 20 villagers along the trek said this or something similar to one of the searchers, Ramesh BK, in the summer, according to the guide and adventure-business owner in the Himalayan nation. Although giving no indication that they do know what happened, the villagers said people there fear that police would improperly point the finger at them if they signaled they knew anything, said BK and other volunteers to whom CNN spoke over the past few months. Some Nepalis living in the area where Aubrey Sacco disappeared have been reluctant to talk about her. While villagers' fear of authority has many roots, including a bloody 10-year insurgency that concluded just four years ago, they cite a specific case: The imprisonment of four Nepali men who reported finding the bludgeoned body of a British hiker in the same valley in 2000. The area villagers believe the men are innocent. Although many factors -- such as the area's remoteness and difficult terrain -- have made clues to Sacco's fate hard to come by, the villagers' fear of Nepali authorities may be a significant obstacle in the hunt for the truth, some of the searchers say. "All the villagers in the Langtang area say that [the arrestees in the 2000 case] didn't do anything, and that the real people who did never got caught. That's what's making the search [for Sacco] so difficult," said BK's American wife, Sandra Krasa. Aubrey Sacco started her trek at Langtang National Park, at the base of the Himalayas north of Kathmandu, on April 21. A Lonely Planet guidebook describes it as a three-day, ascending walk from the lodges of Syabru Besi to the small community of Kyanjin Gompa. The park is inhabited, and the path passes a few villages, mostly collections of lodges and tea houses. It generally follows a river that flows from a glacier near Nepal's border with Tibet. Trekkers can hire guides and register for group excursions, but Sacco, against her parents' advice, went alone. She walked to the village of Pahiro and stayed the night of April 21 at a lodge there, witnesses told searchers. The next day, according to villagers' initial reports, Sacco arrived farther up the trek in a village called Lama Hotel, where she had a meal at a lodge. She left that afternoon, people there initially told the searchers. What happened next is a mystery. No one east of Lama Hotel has ever reported seeing her. An army checkpoint less than two miles from Lama Hotel, at Ghora Tabela, where trekkers are supposed to sign in, has no record of her, searchers say. And no one to the west reported seeing her returning. In early May, the family contacted the U.S. Embassy after not hearing from her, and the embassy put up missing-person posters and asked police and the Nepali military to search. Sacco's father, Paul, one of his sons and a Nepali family friend living in Colorado would eventually spend a month in Nepal, hiring a private search team, walking the trails themselves and contacting volunteers such as BK, who got involved after his wife saw one of the posters. The Nepali military, volunteers and dogs combed the trail, and the private team explored rivers, cliffs and caves in case she went off-trail. There are places to fall from the path, but not particularly between Lama Hotel and Ghora Tabela, because that stretch is relatively safe, several volunteer searchers told CNN. "You'd literally have to jump over the side" to fall along that stretch, Krasa said. And if someone did fall, the person wouldn't land in the river, which is still some meters away, said another volunteer, Dawa Lama, a Langtang native and engineer working in Kathmandu. "Even if she fell down, we would have seen her bag" or other belongings, Lama said. "Nothing like this was left." Investigators say there is no evidence of foul play, though no one has reported finding clues of an accident either. Om Bahadur Rana, police chief of Rasuwa District, said police have taken statements from about three dozen people, and some stories seem to have changed over time. While people at Lama Hotel initially said Sacco had eaten a meal there, now no one there admits they saw her, he said. Shannon Taylor, an American who was working in Nepal and volunteered to search, said locals at Lama Hotel appeared to be growing weary of answering questions about Sacco when Taylor was there in June. 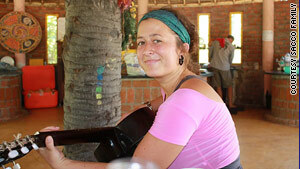 Sacco had been on a post-college trip in South Asia for five months when she disappeared in Nepal. She, too, said she heard park residents say that no one would reveal what happened to Sacco if they knew, some of whom cited the 2000 case of the British hiker. "That's why people are saying no one is going to talk, because they're afraid of police, and it wouldn't be worth it to them," Taylor said. According to British newspaper reports, trekker Tim Prentice, 38, of Bristol, England, was found bludgeoned to death -- apparently as part of a robbery -- on a riverbank near Syabru Besi in March 2000. Four Nepalis were convicted of killing him and were sentenced to prison. At least one was released recently. Area villagers say they believe that police arrested the men only because the four found the body and alerted authorities to it. The villagers allege that the men are innocent and that police accused the four as a matter of convenience. Rana maintains the four were guilty: "The guilty don't say they are guilty." And he says the locals appear to agree with police that if Sacco met with foul play, it would be to their benefit if the perpetrators were found, "because tourists not only bring business but also donate money for their children's education and the like." However, Rana agrees that some people could be afraid because of the arrests in the Prentice case. "We have tried to reassure them that the same fate will not befall them," Rana said. One Langtang National Park-area resident interviewed for this report, Dindu Lama, says he doesn't believe that people are hiding information out of fear. He also believes no local person would have killed Sacco, because locals "are afraid to kill even a chicken." Thiley Lama, father of volunteer Dawa Lama, is another local who voluteered to join the search. He says he has been assuring villagers that anyone revealing information about Sacco wouldn't go to jail. "I have been pleading with them ... to come up with information," Thiley Lama said. "Since they answer with a smile, how can I say they are lying when they say they don't know anything?" Dawa Lama said no one has told him that they wouldn't reveal anything about Sacco if they knew. But he has heard what other searchers have reported and says it is plausible that fear of authorities may keep villagers from talking. "They think if something pops up from their mouth, this turns into them being in custody," Lama said. "They are not happy to speak openly about it." According to Basil Fernando, policy director at the Hong Kong-based Asian Human Rights Commission, Sacco's disappearance and some villagers' responses to it expose a greater problem that Nepal has when investigating potential crimes: the lack of a reliable rule-of-law system and a populace that still is struggling with trusting authority after thousands of people disappeared in the 1996-2006 Maoist insurgency. People not wanting to talk to Nepali authorities "is a very familiar story, not only in more serious cases like disappearances, but even on simple issues like theft," Fernando said. Sacco, a 2009 University of Colorado graduate, planned to seek volunteer opportunities in Nepal, her family says. Maoist rebels and government armed forces fought bloody battles during the Maoist insurgency to abolish the country's monarchy. Thousands of people disappeared, underscoring citizens' distrust of authority, Fernando said. More than 15,000 died in the fighting, and tens of thousands of people were displaced, according to the U.N.
Nepal became a republic in 2008 after elections in which people voted to abolish the monarchy. But the country still is struggling to produce a post-war constitution, and the judiciary is slow and not developed enough to sufficiently protect the accused, Fernando said. "There is reluctance by the people to get involved in the system, because ... if something goes wrong, there is nobody to help them," Fernando said. Should Sacco have met with foul play, it would be unusual because Westerners are rarely targeted there, Fernando said. Would-be criminals fear repercussions that Nepali authorities would exact for harming a tourist, he said. Dan Clegg, who heads the FBI's regional office in neighboring India, said the FBI and the U.S. Embassy -- though they do not have jurisdiction over a missing-person case in that country -- are liaising with Nepalese authorities and ensuring due diligence is done in the Sacco investigation. There is no evidence to suggest that Sacco is the victim of foul play, he said. When asked about reports that citizens indicated they wouldn't talk about Sacco's disappearance if they knew anything, Clegg said that mistrust of authorities is not unique to Nepal. "What you're talking about is a dynamic in all the developing world," Clegg said. "In pretty much any developing country, there is a large degree of fear of the police." U.S. Sen. Mark Udall of Colorado wrote a letter on behalf of the Saccos to the U.S. Embassy in September inquiring whether Nepal might be willing to allow Americans to investigate in that country. Discussions on the matter continue between the senator's office, the FBI and the U.S. State Department, said Jennifer Talhelm, a Udall spokeswoman. How many tourists disappear in Nepal is unclear. A Nepali search and rescue group, Himalaya Rescue Dog Squad Nepal, says Sacco's missing-person case is one of eight involving foreigners that it has recorded on its website since 2003, but some cases probably don't come to the group's notice, and other cases are omitted at the request of families and embassies. Rana said the investigation continues, and Sacco's father said the Nepali police and military have been diligently helping the family search for his daughter. He said his family has increased a reward for information leading to the discovery of Aubrey to 1 million Nepalese rupees (about $14,000) from an initial amount of 100,000 rupees, plus safe passage to India should the informant desire it. Experts had suggested the initial figure to the Saccos; Nepal's gross national income per capita in 2009 was $440, according to the World Bank. Paul Sacco said that when he walked the trail to verify what his searchers were telling him, he, too, got the sense that some locals there were holding back. "We'd go back to confirm what we were told, and as we were talking to the same people, someone else was looking on, and there was eye contact and fear in the eyes of some of the locals," he said. Sacco said he's frustrated by suggestions that locals might withhold information, and he hopes that someone still will step forward. "This is a girl who means the world to her family. She is our entire world ... and as days go by and people aren't talking, our world is shrinking to nothing."